Teufel Audio reveals "complete makeover" of Massive over-ear headphones | What Hi-Fi? It's been more than five years since Teufel Audio first entered the headphone market with its Aureol Massives – and now, after a "complete makeover", its pioneering over-ears have returned for 2015. 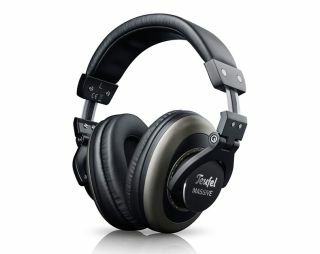 The new Teufel Massive headphones have been designed and developed by the German speaker manufacturer based on feedback from its predecessor, with many features kept in the latest model. A closed headphone design has been used in these over-ears to offer what Teufel is claiming to be "excellent noise blocking properties", which helps immerse you in your movies, music or games. The same foldable design from the Aureol Massives have been carried over to the new cans, albeit with metal hinges and a new aluminium headband added in to ensure a more robust construction. Under the cover, you'll find 50mm neodymium magnet drivers and aluminium copper voice coil that Teufel Audio has included in order to deliver "richer bass and silkier highs". Another feature that has been retained is the removable cable connection on the left ear cup, which itself comes with a soft and breathable leatherette cover for "maximum comfort over long periods". Now available to purchase for £80 from Teufel Audio's online shop, the Massives will include a pair of fabric-covered cables (1.3m and 3m respectively); a 6.3mm jack adapter; and a storage bag.